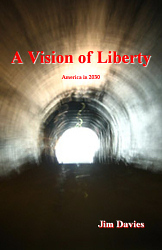 Here is Jim Davies' site about personal freedom. It's not for those content to remain slaves, fully or partly. It's for those who sense that they have the right to own and operate 100% of their own lives, and want to exercise that right as fully as possible. Browse free, as often as you like! First there's a collection of articles written about the subject over several years and still augmented occasionally. They are meant to undo some of the indoctrination we all suffer in twelve years of government schooling. Those provoke the question "could we, then, get along far better without any government at all?" That is explored here and answered with a resounding "YES!" That's radical, and requires rational proof. This Academy offers a way to study the subject in depth, interactively, then how to make it happen in practice - within a single generation. he began in 2010 (bookmark TinyURL.com/ZGBlog and visit often) and between 2008 and 2010 he wrote three books. Click on each cover below to see more. A sweeping review of human history which presents overwhelming evidence that mankind would have been almost infinitely better off without government. Revealing! 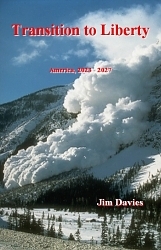 Shows in detail how the change to a free society is, on simple stated assumptions, as inevitable as an avalanche - despite increasing government hostility. Inspiring! 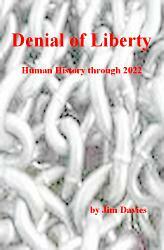 Offers a glimpse of what life will be like in a free society. Unique!